*The share price means the closing price on Jan. 30. No. of shares issued taken from the latest brief financial report. (No. of treasury shares excluded.). ROE and BPS are the values as of the end of the previous term. *The values for the term ended Nov. 2017 are estimated by the company. *The 2-for-1 share split was conducted on Jul. 1, 2014. We will briefly report the financial results for the term ending November 2016 of Morito Co., Ltd.
Morito is a specialized trading company that engages in the entire process of planning, developing, manufacturing, wholesaling, and distributing automobile interior parts and clothing accessories, including hooks and eyes, hook-and-loop fasteners, and "eyelets," which are metal rings for lining a hole for laces on shoes, clothes, etc. Through its history of over 100 years, the company has developed the deep trust of customers, high market share with a wide array of products, global networks, etc. As of the end of November 2016, there are a total of 16 consolidated subsidiaries, 4 domestic and 12 overseas. The founder Jukichi Morito, who had worked for a draper's shop in Osaka as an employee, started a one-man company called "Morito Shoten" in 1908, brokering the trade of eyelets, hooks and eyes. In the Taisho period, the western fashion spread, boosting the demand for shoes and allowing the company to grow rapidly. In 1937, the company internationalized its business by exporting hook-and-loop fasteners to Sumatra and Java, and shoelaces to Johannesburg in South Africa and the U.K. After the Pacific War, the company started selling colored nylon fasteners and hook-and-loop fasteners®. In the 1990s, the company launched the business related to consumer goods, such as automobile interior parts and camera straps, with the aim of promoting general-purpose materials, and expanded its business domain. The company also conducted overseas business actively. In 1989, the company was listed in the second section of Osaka Securities Exchange, and in July 2013, it was registered in the second section of Tokyo Stock Exchange, as Tokyo Stock Exchange and Osaka Securities Exchange merged. Morito changed to the first section of Tokyo Stock Exchange on December 2016. The principle "Active and Steadfast" represents the spirit of Morito that has been fostered since its inauguration, and implies that "Success is ensured by proactively making a judgment and taking action." The backbone of Morita's business is the spirit of the founder Jukichi Morito: "To win over your competitors, you always need to come up with an innovative surprise. Always seek for new ideas while doing business." (1) To supply a variety of parts to the entire world, and pursue the development of a limitless market beyond genres. (2) To give shape to customers' needs, and produce genuine items that would enrich people's lives. (3) To exert the ability to create value from the comprehensive perspective, including fashion, functionality, comfort, and safety, and create a future with all stakeholders. The business of Morita can be classified into three realms: 1) The "apparel component business," which handles clothing accessories, such as eyelets, hooks and eyes, buckles, and fasteners, 2) The "product business," which handles the straps for cameras and mobile terminals, and foot-care products, such as the secondary materials and insoles of shoes, and 3)The "transportation equipment business, which treats automobile interior parts, such as mat emblems and door grips,. In each business, the company conducts the entire process of planning, development, manufacturing, distribution, and sale of products, according to markets and customers' needs, while considering fashion, functionality, comfort, safety, etc. The segments to be reported are the three segments: Japan, Asia, and Europe & the U.S. Sales composition ratio is 45% as of FY November 2016. Morito delivers the accessories of clothes and footwear, including eyelets, hooks and eyes, buckles, fasteners, and rivets, to apparel manufacturers, etc. inside and outside Japan, which are end clients of Morito, mainly via wholesalers, trading companies, and distributors. Morito makes direct transactions with Fast Retailing, GAP, etc. Outside Japan, the popularity of Morito is high, and the company has been carrying out business with GAP, H&M, and ZARA for as long as 10 to 20 years. Sales composition ratio is 44% as of FY November 2016. Morito delivers straps for cameras and mobile terminals, etc to image-related electronics manufacturers. Moreover, the company sells foot-care products, such as secondary materials, insoles of shoes, and shoe cream, as its original brands. As for the business of video equipment materials, the products for Canon account for 45%, and those for Nikon make up 35%. Other clients include Olympus and Kyocera. 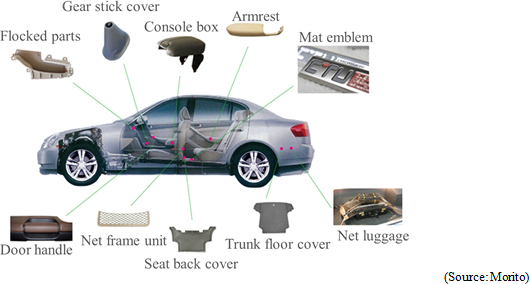 not only delivers automobile interior parts, such as mat emblems, door handles and armrest, nets for the seats of bullet trains, straps for cameras and mobile terminals, etc. to automobile parts manufacturers, image-related electronics manufacturers, etc., but also sells foot-care products, such as secondary materials, insoles of shoes, and shoe cream, as its original brands. Sales composition ratio is 11% as of FY November 2016. Morito handles automobile interior parts, such as mat emblems, door grips and arm rests. The automobile-related business accounts for about 90%. Toyota-related clients occupy 50% of them, Nissan-related ones 30%, and Honda-related ones 10%. As described in the section of corporate history, Morito has been operating apparel component business since its inception, by handling eyelets, hooks and eyes, hook-and-loop fasteners®, etc. The company increased the purposes of use of general-purpose materials, and launched the product business including the transportation equipment business. At the present, sales composition ratio is 50 % of the apparel component business and 50% of the product business including the transportation equipment business. This business portfolio stabilizes the performance of Morito. The company has never fallen into the red, even during the two postwar oil shocks and the global economic crisis in the wake of the bankruptcy of Lehman Brothers. The company has high market share for various products, as tabulated below. Although some enterprises in emerging countries supply products at lower prices than Morito, Morito won the trust of clients with its capabilities of dealing with all processes, including planning, development, manufacturing, and distribution, and coping with various situations appropriately, and the quality of its products, including safety, which had been developed through its long history, achieving high market share. For example, Morito gives appropriate technical advice from the stage of producing samples for clients, repeatedly fine-tunes coloration to meet the needs of clients, and keeps checking products after the start of full-scale production. Namely, the company not merely sells products, but clears many hurdles before starting transactions, and provides clients with a system for all processes from upstream to downstream ones. The provision of such added value is highly evaluated by clients, mainly the famous brands outside Japan. Planning and development are conducted mainly in Japan. The company owns many production and distribution facilities in Europe; North, Central, and South Americas; Asia-Pacific region, and Africa. With the aim of growing as a global company, Morito is enriching international production sites and sales networks, and developing internal systems to underpin global business administration. If this progresses as planed and its global network is fortified, the competitive advantage of the company will be enhanced further. In addition to the above three items, its unique positioning, too, can be said to characterize Morito. 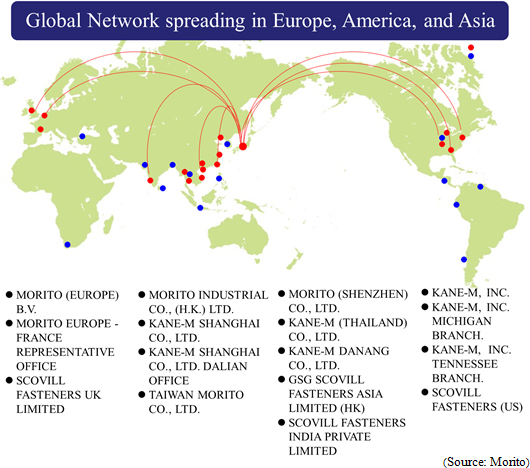 When considering just one among Morito's many products, there are always some competitors, but Morito is the only one company in the world that handles such a variety of products, deals with all processes, including planning, development, manufacturing, distribution, and sale, and has sales exceeding 40 billion yen. For the term ended November 2016, ROE declined by 0.8% from the previous term due to decrease in net income ratio to sales and total asset turnover. In the Seventh Mid-Term Management Plan, a target value is not specified, but the improvements in margin and asset efficiency are expected. Due to the strong yen, sales dropped, but operating income grew. Sales were 40,086 million yen, down 7.4% year on year. Sales dropped in Japan, Asia, Europe, and the U.S., but the effect of the yen appreciation accounts for over 80% of the drop in sales. Gross profit rate rose 1.2%, but gross profit declined due to the decrease in sales. Operating income increased 2.7% year on year to 1,767 million yen, thanks to the reduction in personnel cost and SG&A expenses. An exchange gain of 48 million yen posted in the previous term dropped to an exchange loss of 155 million yen in the current term. Then, ordinary income decreased 12.0% year on year to 1,647 million yen. There was no longer a loss from the liquidation of affiliates amounting to 495 million yen posted in the previous term, but the gain on sale of investment securities and noncurrent assets decreased, and so net income declined 17.5% year on year. Sales did not reach the revised estimate, but operating and ordinary incomes exceeded the estimates. Sales decreased 1.1% year on year, but profit grew 11.4%. The sales of accessories targeted at leading mass retailers and manufacturers of outdoor and sporting apparel increased. On the other hand, the sales of accessories for ladies' apparel declined. 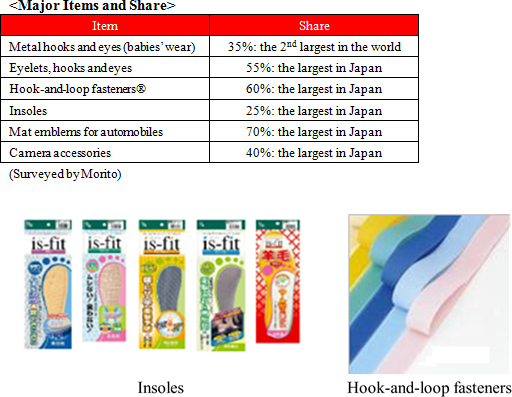 The sales of accessories for video equipment were favorable, but the sales of health-related accessories and products, such as athletic braces, hook-and-loose fasteners, and shoes related products, such as sock-liners, decreased. The measures for improving profit rate, including the narrowing down of distributors, showed some effects. Sales decreased, due to the decrease in the production output of automobile manufacturers, the effects of the Kumamoto Earthquake, etc. The sales of accessories for small vehicles, which had been favorable in the previous term, declined. Sales dropped 19.9% and profit grew 4.5% year on year. The sales of accessories targeted at European and U.S. manufacturers of baby clothes in Hong Kong and Japanese apparel manufacturers in Shanghai declined. The sales of accessories for video equipment in Thailand decreased. The sales of the interior accessories of automobiles for Japanese automobile manufacturers in Thailand grew, but those in Shanghai declined. ◎ Europe and the U.S. Sales and profit decreased 19.0% and 46.6%, respectively, year on year. As retail and production in the U.S. were adjusted, the sales of accessories for the domestic market of the U.S., including apparel and sporting goods, declined. The sales of accessories for video equipment in Europe decreased. Sales declined, because the plan for the interior products (mat emblems) of automobiles targeted at European automobile manufacturers changed to embroidery. In addition, the sales to Japanese automobile manufacturers in the U.S. decreased due to the effect of exchange rate, but in foreign currency, the sales healthily grew 17% year on year. Current assets decreased 1,039 million yen from the end of the previous term, due to the decline in cash and deposits, trade receivables, etc. Noncurrent assets dropped 5,456 million yen from the end of the previous term, due to the decline in property, plant and equipment, etc., and total assets decreased 6,477 million yen to 40,853 million yen. As current liabilities decreased 4,981 million yen due to the drop in short-term debts while noncurrent liabilities augmented 357 million yen from the end of the previous term through the issuance of corporate bonds, total liabilities decreased 4,624 million yen to 11,592 million yen. As retained earnings grew, but treasury shares increased and foreign currency translation adjustment declined due to the strong yen, net assets shrank 1,852 million yen to 29,260 million yen. As a result, equity ratio rose 5.9% from the end of the previous term to 71.6%. Operating CF shrank from the previous term, due to the decline in profit, the augmentation of the payment of corporate income tax, etc. Investing CF became positive due to the sale of property, plant and equipment, etc., and free CF expanded. Financing CF dropped further, due to the decrease in short-term debts, etc. although corporate bonds were issued. The balance of cash and cash equivalents decreased 500 million yen from the end of the previous term. Sales are estimated to be 43 billion yen, up 7.3% year on year. Sales are projected to grow in all regions. Especially in Asia, sales are forecasted to rise by double digits. Operating income is estimated to be 1.8 billion yen, up 1.8% year on year. It is assumed that exchange rate is 1 US dollars = 106 yen. In this term, which is the second year of the 7th mid-term managerial plan, Morito will accelerate its business activities in not only ASEAN, China, Europe, the U.S., but also uncultivated markets, mainly by developing value-added products made in Japan and expanding revenue from global business operation. As for the return of profit to shareholders, Morito upheld the basic policy of "keeping payout ratio 30% and consolidated dividends on equity (DOE) 1%" till the previous term to achieve continuous dividend payments, but the company will set a policy of "keeping payout ratio 50% or over and DOE 1.5%" this term. Payout ratio is to be 26.6%, but the payout ratio based on the common dividend of 22.00 yen/share, excluding commemorative dividends, and profit attributable to owners of parent, excluding extraordinary income and loss, etc. will exceed 50%. On Jan. 25, 2017, the company announced that it will acquire up to 700,000 treasury shares, worth 700 million yen. The acquisition period is from Jan. 25 to Feb. 21, 2017. On the other hand, the company decided to discontinue the provision of the privileges for shareholders, to return profit to shareholders primarily by dividends. Morito is planning M&A, following Scovill. The company will pursue the expansion of its scale and synergetic effects. It is preparing for the establishment of a production site targeted at the North American automobile market in Central America, and will expand its business in the west coast of the U.S.
Morito is also planning the launch of the B-to-C business, and considers the cooperation between industry and academia for IoT, and aims to actualize out-of-box business. Morito will design an optimal fund procurement policy and reconstruct a distribution center based on procured funds. Morito already has various systems, but will adopt systems for invigorating personnel, including the childcare leave for male employees and further reduction of overtime working hours, and concentrate on the promotion of diversity management. Morito will comply with the corporate governance code while grasping its unique characteristics. The effects of the M&A with Scovill in 2014 are being exerted steadily. In the term ended Nov. 2016, the integration of warehouses in Europe and offices in Hong Kong was completed. This is expected to reduce cost by about 30 million yen annually from this term. The sales due to the synergy were 1.5 million US dollars. For the term ending Nov. 2017, the target sales due to the synergy are 4.5 million US dollars, much larger than those in the previous term. From now on, the production sites of Morito and Scovill will be integrated or abolished, to streamline their business further. In the second quarter, the full-year earnings forecast was revised downwardly, and the progress rate of profit in the results for the second quarter was as low as about 40% with respect to the revised earnings forecast, but in the end, the results exceeded the forecast. It seems that performance was favorable in the second half. This trend continues this term, and sales are forecasted to increase in the three regions where sales dropped in the previous term. Its share price is healthy, as Morito was listed in the first section of Tokyo Stock Exchange and the return of profit to shareholders was improved, although the privileges for shareholders were abolished. This term, operating income is expected to mark a record high like in the previous term. We would like to pay attention to the progress of their business. This report is intended solely for information purposes, and is not intended as a solicitation for investment. The information and opinions contained within this report are made by our company based on data made publicly available, and the information within this report comes from sources that we judge to be reliable. However we cannot wholly guarantee the accuracy or completeness of the data. This report is not a guarantee of the accuracy, completeness or validity of said information and opinions, nor do we bear any responsibility for the same. All rights pertaining to this report belong to Investment Bridge Co., Ltd., which may change the contents thereof at any time without prior notice. All investment decisions are the responsibility of the individual and should be made only after proper consideration. Copyright(C) 2017 Investment Bridge Co., Ltd. All Rights Reserved.